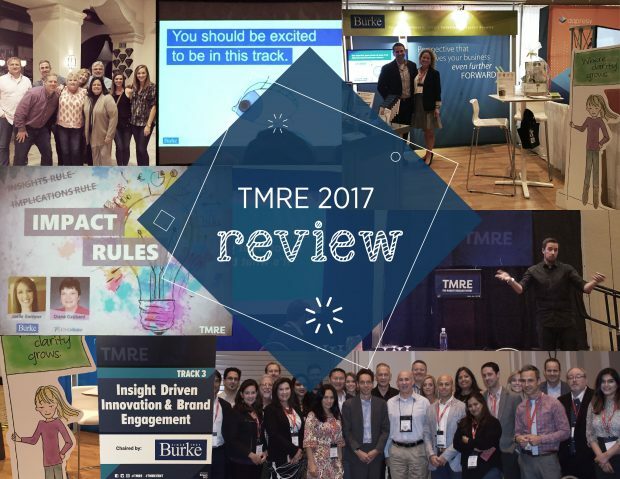 The Burke and Seed Strategy Team joined forces at The Market Research Event in Orlando this past October ready to learn and network with the best in the industry. With topics ranging from cyborgs and classical music to data synthesis and storytelling, this year’s TMRE packed a punch of content into three days. Storytelling was on everyone’s mind at this year’s event with multiple speakers bringing their own twist to the topic of turning insights into action through powerful imagery, concise communication, and team collaboration throughout the process. Burke’s own Joelle Gwinner presented alongside Diana Gabbard from U.S. Cellular on the importance of team involvement to the storytelling process. Transparency throughout insights development helps increase organizational access and engagement. This organizational buy-in allows key stakeholders to make decisions quicker and put data into the correct context. They also stressed the importance of making connections across the work the team does to find opportunities to triangulate better insight and tell better stories. Other presenters focused more on the visual aspect of storytelling. Deckers Brands spoke on their success in illuminating segmentation with the use of visually stoppable look books that inspired the creative team and brought segments to life. Keynote speaker Cole Nussbaumer Knaflic spoke tactfully about how to create more visually impactful and consumable reports and presentations that inspire action, not confusion. Through meaningful data visualization, simplified design and color use, presentations have the power to tell meaningful stories with a clear call to action. Malcolm Gladwell’s memorable keynote echoed the sentiment of understanding the meaning of data and not simply relaying meaningless numbers. In order to implement impactful storytelling, we must have a full and interrogated view of the data, where it comes from and how it came to be. As researchers, we must remember to ask questions about the data itself to make more informed decisions. More and more companies and researchers are realizing the value in synthesizing multiple data sources to have a more robust consumer view. Companies like FabFitFun and Sephora shared presentations on how they leverage their extremely loyal customer base to conduct primary research while adding context with behavioral and transactional data. These companies are applying their “scrappy” techniques to see the full picture of the consumer, predict behavior, and the potential success of marketing initiatives. Marriott shared their journey on developing the ideal global brand health understanding through the synthesis of brand heath survey data, distribution data, consumer behavioral data, customer satisfaction data, social media data, and various other trackers measuring advertising, frequent guest satisfaction and segmentation data. This multitude of data sources allowed the Marriott insights and advisory teams to tell a holistic consumer story grounded in various data truths. Several presenters shared their experiences applying traditional research techniques to new business challenges. Jennifer Avery with Universal Orlando spoke on the various applications of conjoint analysis used to better understand guest expectations for complex experiences. The team used conjoint to simulate the ideal day at the park, optimize the dining portfolio to capture different dining segments, and to determine ride satisfaction based on ticket purchased and wait time. These inventive applications allow the Universal team to understand consumer experiences on a much deeper level. A presenter from Mars Confectionary cautioned of the dangerous implications when not applying traditional benchmark testing among consumers, especially for drastic packaging changes. She shared her experience with an unsuccessful packaging change and honed in on the importance of ensuring you can compare back to benchmark findings and validate package success after launch. Notably absent from this year’s event was a nod to non-conscious measurement, a popular topic in year’s past. This emphasis on traditional methods may be taking the place of some more cutting-edge applications that have previously dominated the conversation at TMRE. As a member of Burke’s Client Services team, Ashley Chase is always looking for new and unique research applications that can help our clients overcome their business issues. She is passionate about uncovering new ways to gather data and understand what drives consumer behavior.